The market leading transport phenomena text has been revised! 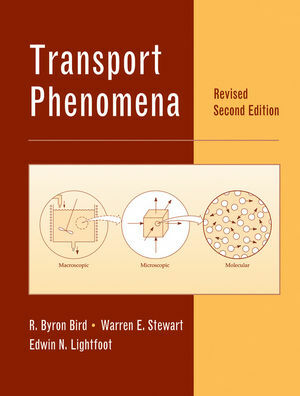 Authors, Bird, Stewart and Lightfoot have revised Transport Phenomena to include deeper and more extensive coverage of heat transfer, enlarged discussion of dimensional analysis, a new chapter on flow of polymers, systematic discussions of convective momentum, energy, and mass transport, and transport in two-phase systems. If this is your first look at Transport Phenomena you'll quickly learn that its balanced introduction to the subject of transport phenomena is the foundation of its long-standing success. About the Revised 2nd Edition: Since the appearance of the second edition in 2002, the authors and numerous readers have found a number of errors--some major and some minor. In the Revised 2nd Edition the authors have endeavored to correct these errors. A new ISBN has been assigned to the Revised 2nd Edition in order to more easily identify the most correct version. For Bird's corrigenda, please click here and see Transport Phenomena in the "Books" section. R. Byron Bird is a chemical engineer and professor emeritus in the Department of Chemical Engineering at the University of Wisconsin-Madison. He is known for his research in transport phenomena of non-Newtonian fluids, including fluid dynamics of polymers, polymer kinetic theory, and rheology. Warren E. Stewart is the author of Transport Phenomena, Revised 2nd Edition, published by Wiley. Chapter 0. The Subject of Transport Phenomena. Chapter 1. Viscosity and the Mechanisms of Momentum Transport. Chapter 2. Shell Momentum Balances and Velocity Distribution in Laminar Flow. Chapter 3. The Equations of Change for Isothermal Systems. Chapter 4. Velocity Distributions with More Than One Independent Variable. Chapter 5. Velocity Distributions in Turbulent Flow. Chapter 6. Interphase Transport in Isothermal Systems. Chapter 7. Macroscopic Balances for Isothermal Flow Systems. Chapter 9. Thermal Conductivity and the Mechanisms of Energy Transport. Chapter 10. Shell Energy Balance sand Temperature Distributions in Solids and Laminar Flow. Chapter 11. The Equations of Change for Nonisothermal Systems. Chapter 12. Temperature Distributions with More than One Independent Variable. Chapter 13. Temperature Distributions in Turbulent Flow. Chapter 14. Interphase Transport in Nonisothermal Systems. Chapter 15. Macroscopic Balances for Nonisothermal Systems. Chapter 16. Energy Transport by Radiation. Chapter 17. Diffusivity and the Mechanisms of Mass Transport. Chapter 18. Concentration Distributions in Solids and Laminar Flow. Chapter 19. Equations of Change for Multicomponent Systems. Chapter 20. Concentration Distributions with More than One Independent Variable. Chapter 21. Concentration Distributions in Turbulent Flow. Chapter 22. Interphase Transport in Nonisothermal Mixtures. Chapter 23. Macroscopic Balances for Multicomponent Systems. Chapter 24. Other Mechanisms for Mass Transport. Appendix A. A Vector and Tensor Notation. Appendix B. Fluxes and the Equations of Change. Appendix D. The Kinetic Theory of Gases. Appendix E. Tables for Prediction of Transport Properties. Appendix F. Constants and Conversion Factors. Revised to include more extensive reference to applications of material covered and the addition of appendices.